One of the most important lessons in education is that the work you submit must be your own. Wikipedia is no different, but some students seem to stumble into plagiarism when they embark on their course assignments. Finding good resources is a crucial step in most Wikipedia assignments. These resources serve as the backbone for an article or as the source that verifies their facts. While these resources are critical, many students may fail to recognize the distinction between “putting it into their own words,” which is encouraged, and “close paraphrasing,” which is not. And yet, students are told that Wikipedia forbids original research — that it’s wrong to connect two pieces of information from different sources and derive a conclusion in their articles. 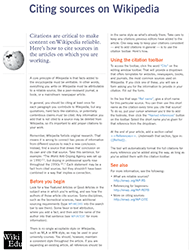 For students used to citing sources as a means to contributing their own ideas, this may be well outside of their comfort zone, which can lead to fundamental misunderstandings of what plagiarism on Wikipedia means. It’s important to stress that a Wikipedia article or edit has a different set of goals and norms than most traditional writing assignments. You won’t see large blocks of quotations on Wikipedia very often. That’s because Wikipedia favors a paraphrase format, in which texts are understood and their ideas restated in an otherwise original way (though short quotations are allowed). This re-articulation of the author’s idea should be followed by a citation. Taking notes for a Wikipedia article is different. Copy key ideas, not key passages of text. Examine a variety of explanations in the topic area, and synthesize them into your own understanding. From there, you can write about your topic by generating your own text, rather than relying on the sources for direct quotations. When you have articulated the idea, cite the sources used to inform that writing. When you’ve finished your draft, read it with your sources close by, and ensure that nothing is too similar. Material in your sandbox is still subject to Wikipedia’s policies, so don’t copy and paste sources into a sandbox, either. Another common problem is close paraphrasing. This means copying a sentence, changing a few words to words that mean more or less the same thing, but otherwise keeping the structure, grammar, and flow of the original text. Original text: Because the weather forecast called for rain, the league decided to switch the location of the game to an indoor facility. Close paraphrasing: The league switched the game’s location to an indoor facility due to a weather forecast calling for rain. (Unacceptable). Ideal paraphrasing: Forecasted rain caused the league to move the game indoors. (Acceptable). You don’t need to strike fear into the hearts of your students to get these points across. It may be useful to frame this discussion in terms of writing for the real world, with a public audience that will hold them accountable, as opposed to the closed hub of academic writing. This approach also reiterates the value of the assignment: They’re producing information for the public, and need to take responsibility for the information they share. Hopefully, it will inspire students to take their assignments seriously, and raise questions about their own approach to writing and understanding the material they encounter in academia. Students should be encouraged to truly grasp the information they read and share. The result can be transformative not only for their assignment, but in how they understand and approach their academic work in general. There are two freshly revised handouts covering these topics: Citing sources on Wikipedia, and Avoiding plagiarism on Wikipedia. 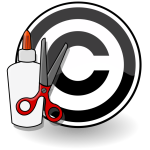 Image Attribution: “Copyright-problem paste” by Rugby471 and Cronholm144 – Own Work & OpenClipart Library. Licensed under Wikimedia Commons.